Sometimes the requests I receive for historical information have nothing to do with Water and Sewage. A friend from the Pratt Library and then one from the Baltimore City Archives both sent me request for information on a 1990 article in the Maryland Historical Society Magazine. The article concerned rye whiskey made in Maryland. Accompanying the article was this photograph. 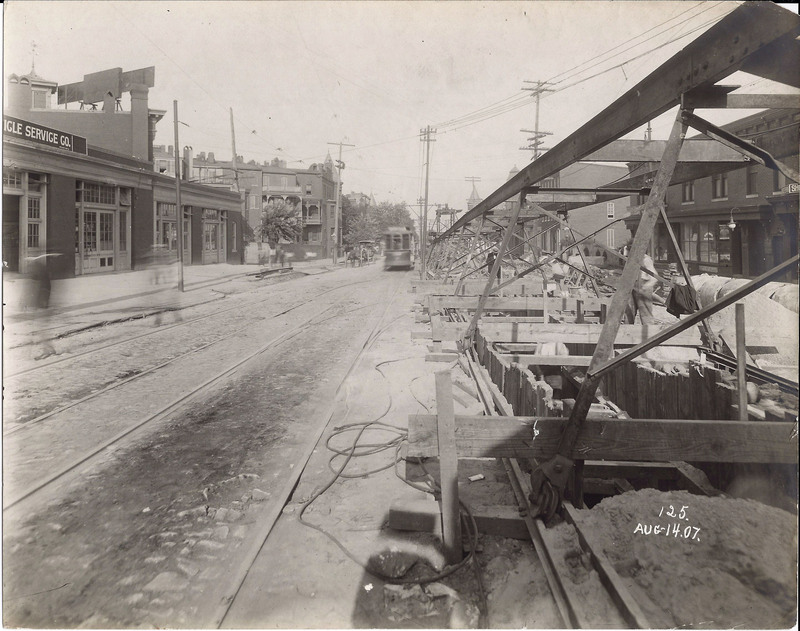 The caption underneath states: “At Wolfe and Aliceanna streets, about 1910 (Actual 1907), a Phillip Lobe Co. vehicle speeds barrels of Ram’s Horn whiskey to saloons. 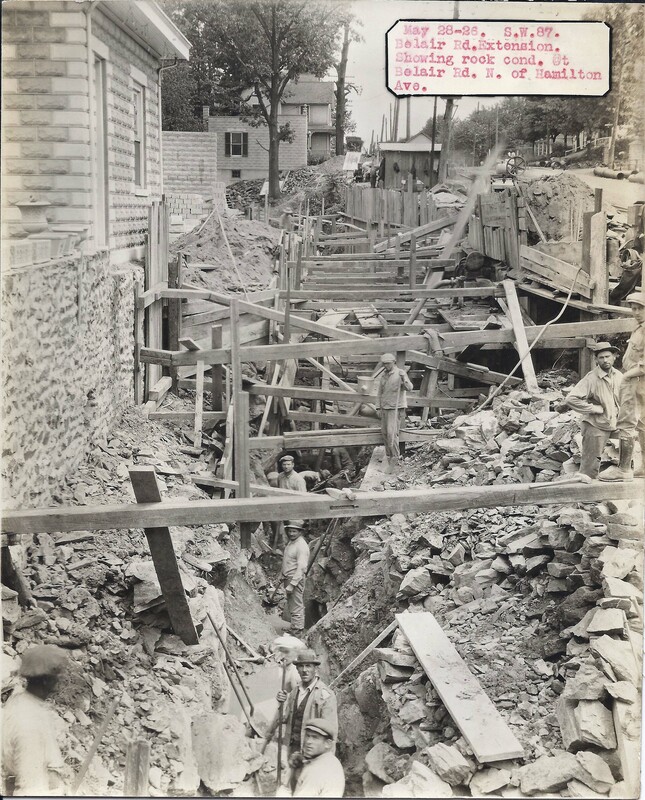 Photograph courtesy Baltimore Public Works Museum.” The person seeking the information wrote me this: I am a relative of Phillip Lobe and am writing an article about his business for a national bottle collector’s magazine. I would love to use this photo in my article as well as getting a nice, clean version of the photo if possible. Could you help me with that pursuit? Since the photo came from the DPW Museum, of which I have been documenting, I was able to find a much clearer photograph. On the side of the wagon to the right, Rams Horn, it has written; Lobe and Son W. Pratt Street. The caption in my notes states: SWC 2. Wolf and Aliceanna Sts. showing gutter plates and openings. While searching for the above, I came across some other photographs that I forgot about. And this is how my mind wanders, from one thing to another! Another concern while installing mains was trolleys zipping by: SWC 1. 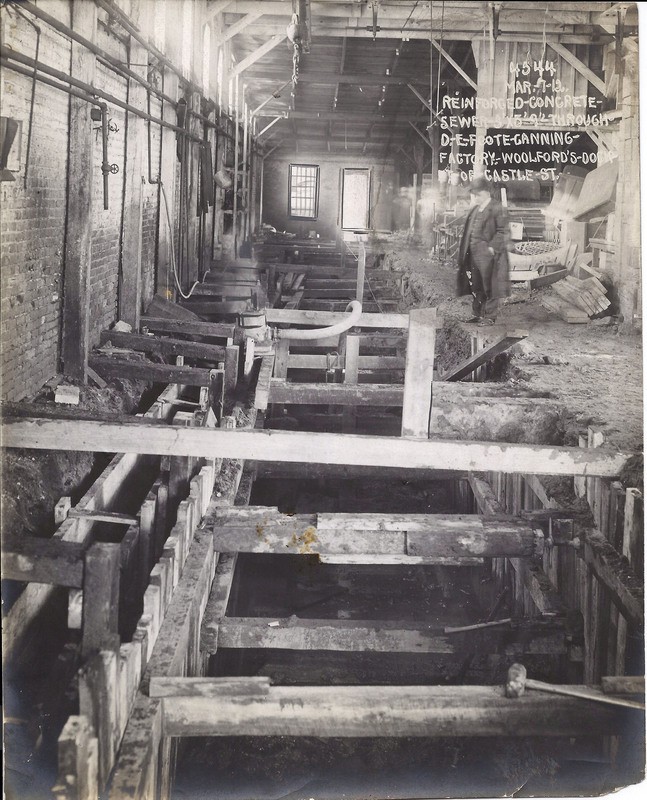 Showing excavation at North and Madison Aves. Of course there was always a crowd watching: SWC 3. Saratoga St above Gay showing obstructing pipes and conduit. More pipes: SWC 2. 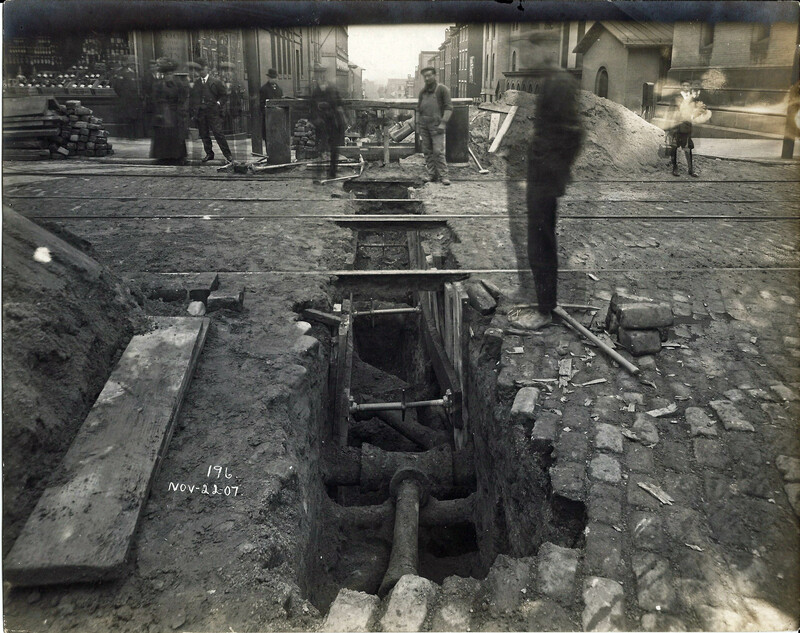 South St at Pratt showing nest of pipes encountered in SW trench. There was always the possibility of adjacent homes crashing down on the workers: SW87. Belair Rd extension, N of Hamilton, showing rock condition. 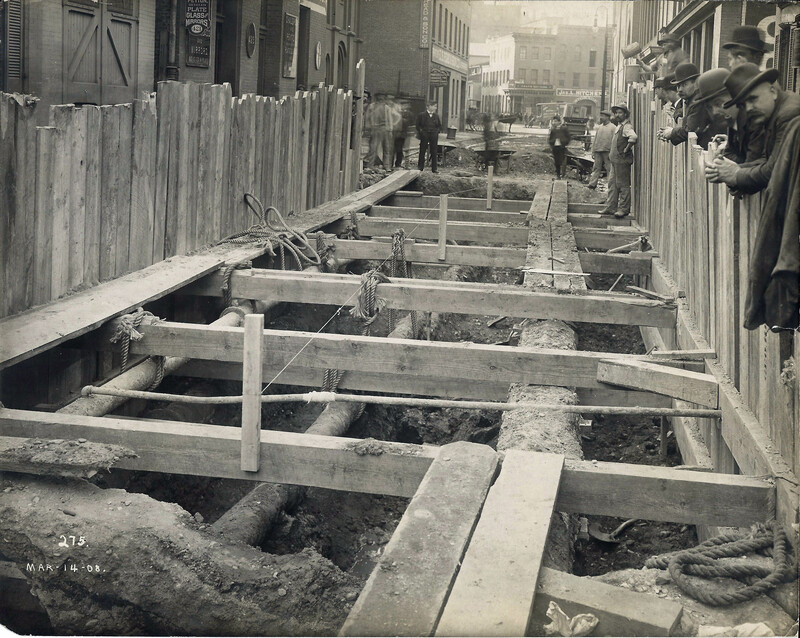 And you also had the placing of wood pipe connections to concrete ones: SWC 2. 62” wooden stave pipe at outlet of Light St drain. (Other marking: Showing barrel construction of outlet). 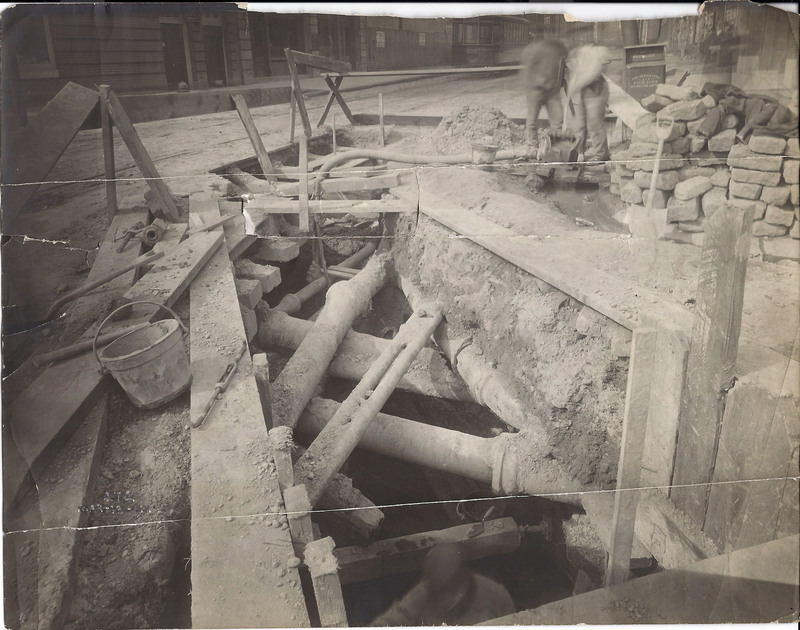 But one of the bigger problems was when you had to go through someone’s house or business: Reinforced concrete sewers through D.E. 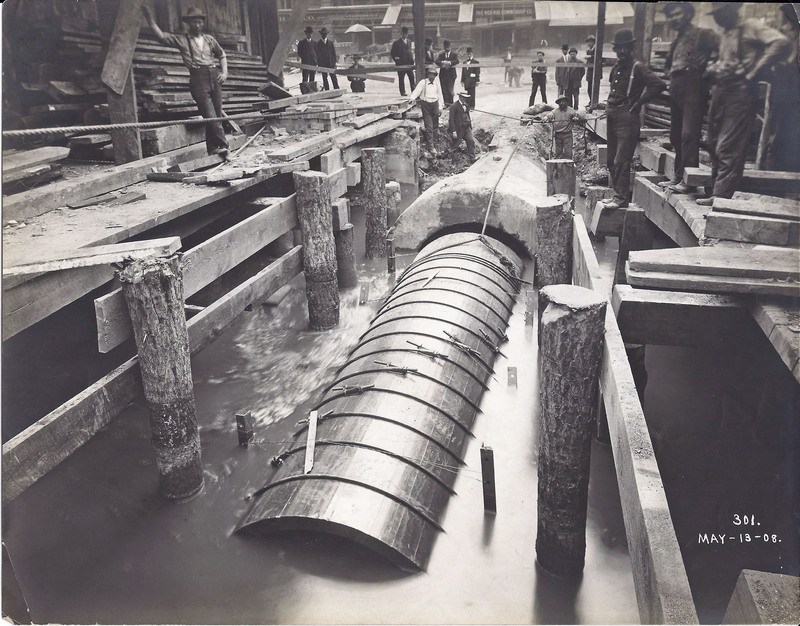 Foote Canning Factory, Woolford’s Dock, foot of Castle St.
More pipes to work around: SWC 3. 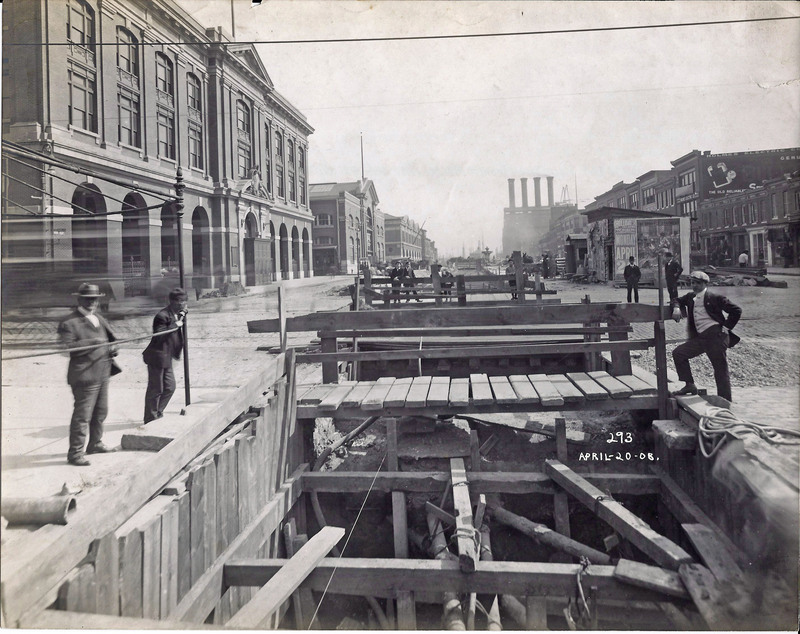 Double 50”x69” storm water drain in Market Place at Baltimore, looking towards outlet. So my mind wanders more times than not, but it is always fun and a pleasure to research these sort of things! I look forward to reading Ms Davis’ article. Thank you for posting that great pic of Belair Rd. above Hamilton Ave. Wonderful to see a glimpse of what my neighborhood looked like! You are welcome. I use to hang around here in the late 60s. 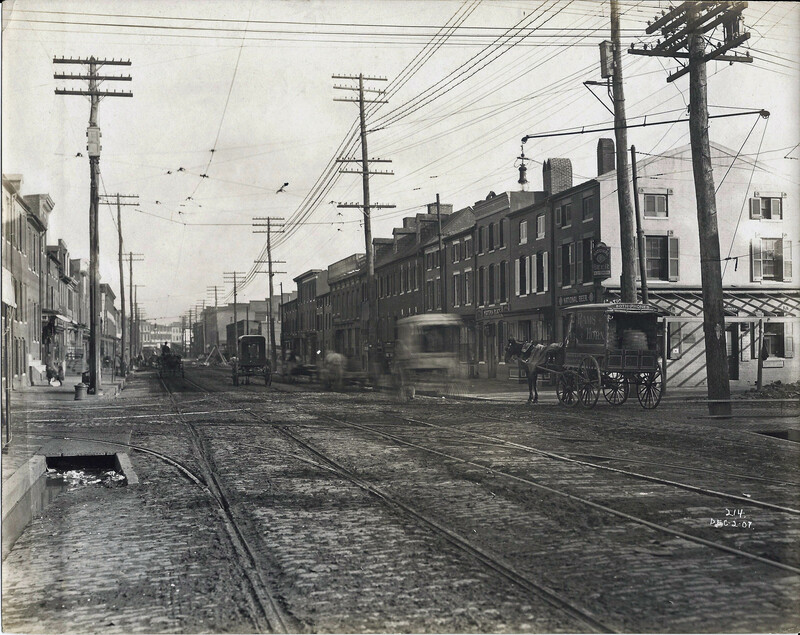 Somewhere on this blog or Facebook I posted some photos of Frankford and Belair, before the shopping center was built. Thanks for visiting my blog! I saw in the second photo, in the center rear, a banner bearing the name “Frank M Barrett” – I think that was my grandfathers brother! I’d like to learn more about that sign and location – any help? The caption on the reverse says Charles and Saratoga. Not sure of the business. Maybe someone on the Facebook page, Baltimore City Historical Society can help you out.